To say that Little Computer People was ahead of its time is an understatement. 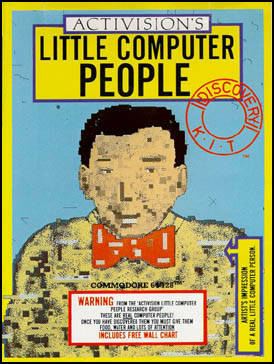 As the forerunner to life simulators such as Tamagotchi and The Sims, Little Computer People was developed in 1985 by famous game designer David Crane (responsible for such hits as Pitfall! and Ghostbusters). In an age when the console market had yet to be resurrected by Nintendo's NES in North America and Europe, and computers were the new kings of video games, David Crane developed a game that was not a game… and it was a short-lived hit. The game has no winning conditions, and only one setting: a sideways view of the inside of a three-story house. After a short time, an animated character (always male) will move in and occupy the house. He then goes about a daily routine, doing everyday things like cooking, watching television or reading the newspaper. Players are able to interact with this person in various ways, including supplying food, entering simple commands for the character to perform, playing a cards and word games with him, and offering presents. On occasion, the character initiates contact on his own, inviting the player to a game or writing a letter explaining his feelings and needs. Each copy of the game generates its own unique character, so no two copies play exactly the same. 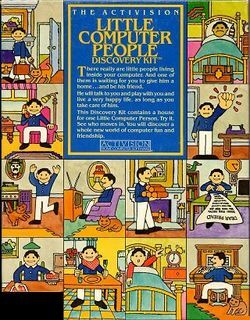 The documentation that accompanied the game fully kept up the pretense of the "little people" being real, and living inside one's computer (the software merely "bringing them out"), with the player as their caretaker. Two versions of the game existed for the Commodore 64: the disk version, which played as described above, and the cassette version, which omitted several features (and was considered crippled). On tape versions, the Little Computer Person was generated from scratch every time the game was started up (not only on the first boot, as with other versions), and thus did not go through the "moving in" sequence seen on other versions. Also, on cassette versions the Computer Person had no memory, and did not communicate meaningfully with the user; and the card games, such as Poker, could not be played. In Japan, Little Computer People served as the direct inspiration for the Square published Apple Town Monogatari (or Apple Town Story) for the Famicom Disk System, which is essentially the same concept, but the man is replaced by a school-aged girl, and the dog is replaced by a cat. While the little computer person who lives in the house on the disk will perform most of his activities without any cue from you, there are ways for you to interact with him, some of which are vital to his comfort. For one thing, he will run out of food and water unless you actively provide him with some throughout the game. Without food and water, he will get sick and miserable and stay in bed all day. Likewise, you should help him pay attention to his dog's bowl. Other ways of interacting are purely to make him feel better, such as giving him a call, or dropping off a present such as a record or a book. And nothing makes your person happier than nice pat on the head. The happier he is, the more likely he is to listen to you when you have a request for him. But no matter what mood he is in, don't forget to be polite and say "please," or he will be less inclined to listen. In addition to these forms of interaction, your little computer person will even play games with you, including card games like War, or Poker, and word games like Anagrams. If you get bored watching him after a while, try challenging him to one of these games. Back when this game was first published, just about every player who bought the full disk version of the game (as opposed to the budget cassette version) would receive a wholly unique little computer person (and dog), whose characteristics were based upon a serial number that was literally written to each disk that was published. This makes Little Computer People one of the few games ever made where no two original disks are ever 100% copies of one another. The Den is where your little computer person will relax and entertain himself. There's quite a lot here for him to enjoy, including watching the television from a comfy sofa chair, dance to a record on the phonograph, or playing some of his own music on the piano. Commands:Ctrl+R - This will leave a new record outside your person's front door for him to collect and listen to. Requests: Please play the piano; Please play a record; Please dance. There are two important things located in your little computer person's study; a cabinet, and a typewriter. The cabinet is where he stores all the games that the two of you will play together (although he prefers to play at the kitchen table). And he will use the typewriter to send letters to you to let you know how he's feeling and what's been on his mind lately. 'Requests: Please write a letter; Please play a game; Please play cards. The bedroom is, quite obviously, where your little computer person likes to sleep. Late at night, he will get changed in the closet, and slip into bed to doze off for a while until his alarm goes off. If he's in a good mood, he also likes to do some calisthenics on the little rug in front of the dresser. Commands:Ctrl+A - Pressing this will set off the alarm next to your person's bed. Be sure to let him get enough sleep before you activate it or he will be grumpy. These two smaller rooms are used by your little computer person from time to time. In the bathroom, he may brush his teeth, or step behind the wash closet door to use the toilet. In the office, he keeps a bookshelf, and he likes to play with his computer. Sometimes he write papers, sometimes he works with a bar graph program, and other times he just doodles or plays games. The clock on the wall displays accurate time according to what you entered when you loaded the game. Commands:Ctrl+B - This will leave a new book outside your person's front door for him to collect and read. Requests: Please brush your teeth; Please play with the computer. The kitchen is certainly an important room not only for your little computer person, but also for his dog. The kitchen is where he'll find food to eat and water to drink, and it is also where the dog's bowl can be found. Make sure that neither one of them goes hungry. If your person would like to play games with you, he'll set up at the kitchen table before challenging you. Commands:Ctrl+F - Pressing this will deliver a package of food to the front door for your person to collect and store in the cupboard. Ctrl+W - Pressing this will refill your person's water cooler. Each time you press it restores one cup's worth of water. Ctrl+D - Pressing this will deliver a can of dog food to the front door for your person to collect and fill the dog bowl with. Requests: Please drink water; Please feed the dog. The living room is a quiet place for relaxation and contemplation for your little computer person. He likes to sit in the chair and read the newspaper. It's also where the entrance to the house can be found, and where you can have the most direct interaction with him besides playing games with him. Commands:Ctrl+C - This will cause the phone to ring. Your person will pick up the phone and have a chat with you. Ctrl+P - This is, by far, your person's favorite form of interaction: It gives him a little pat on the head. He will even come down to the Living Room from wherever he is just to receive it. Requests: Please light a fire. In order to display every feature of the house as distinct objects, Little Computer People often had to stretch the graphic capabilities of each system to the max. As a result, the background (or wallpaper if you will) of the homes are black, in order to help the person and brightly colored objects stand out better. Most layouts of the homes are identical, except for a few alterations which were made to the Apple II version for unknown reasons. With a far greater palette of colors to choose from, the 16-bit versions of Little Computer People benefit greatly from ability to show objects with more detail and colors. Regardless of the time of day, the scene outside is always shown lit by sunlight. Even the games that your little computer person will play with you are rendered in sharper detail. This page was last edited on 16 February 2015, at 10:43.